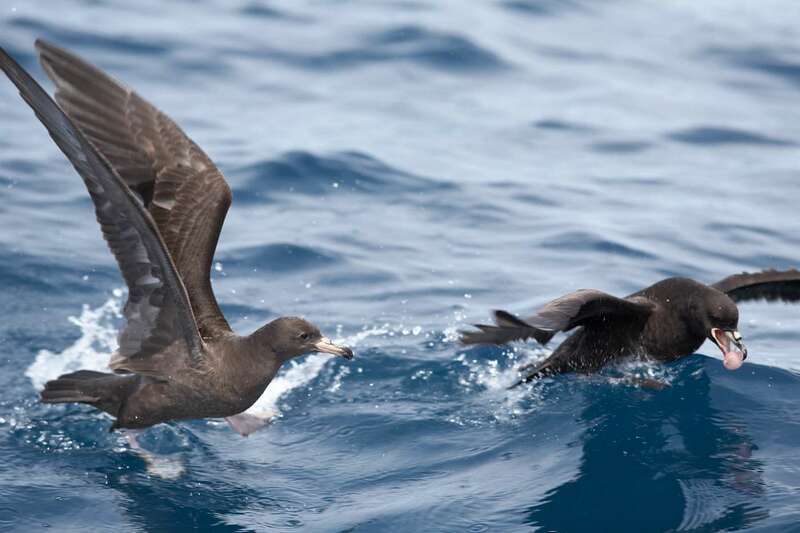 Teamwork during a Te Papa funded charter trip in the Hauraki Gulf got us a step closer in the hunt for the breeding grounds of the recently rediscovered New Zealand Storm-Petrel (Pelaeornis maoriana). 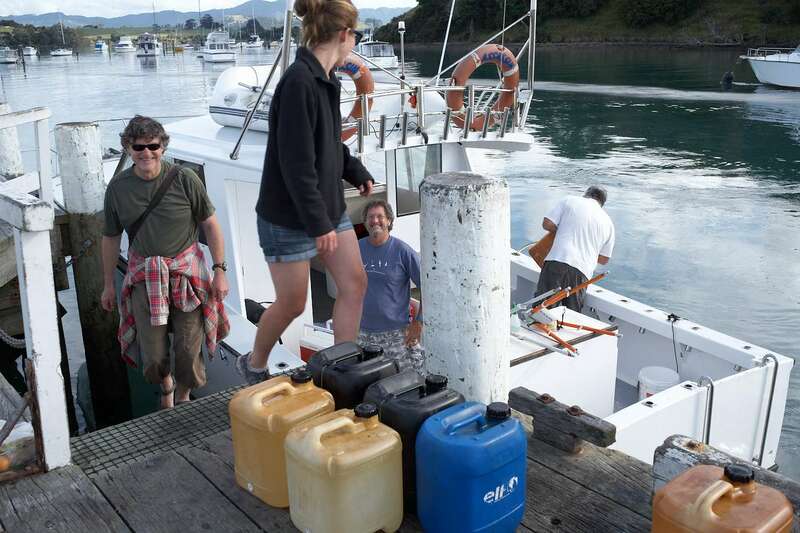 The search team included Te Papa researcher Jean-Claude Stahl, Chris Gaskin who is part of the New Zealand storm-petrel research group, and Brett Rathe from Assassin Fishing Charters, all seasoned storm-petrel chasers. 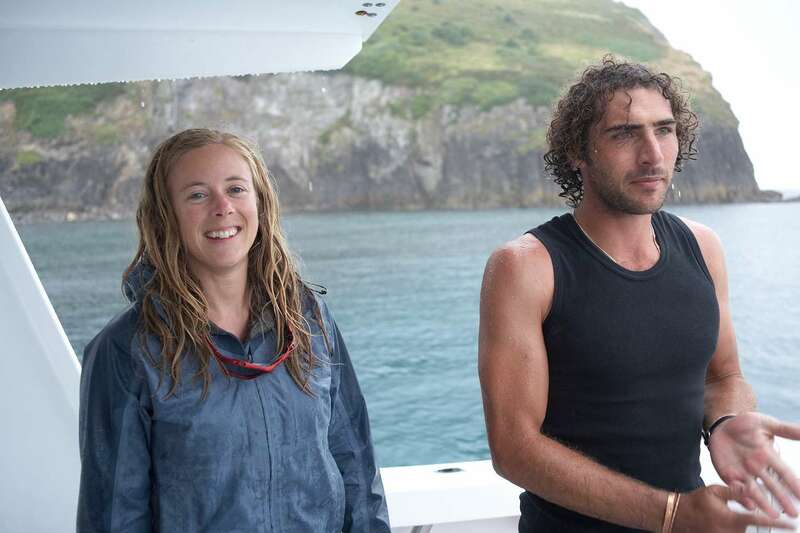 Also joining the trip were Dylan Owen from the National Library, and Jacinda Woolly, a trainee ranger with the Auckland Council Parks staff, who was to be dropped off on Burgess Island to participate in petrel studies ashore. The date of the trip (20 February) was chosen to maximize the chances of success. It was estimated to fall around the provisional hatching time (back calculated from the latest published sightings in the greater Hauraki Gulf), when foraging trips are at their shortest and many non-breeding birds attend colonies. And it also fell just before new moon, when storm-petrels return ashore just after dark rather than waiting for moonset later at night as they often do during the first quarter. 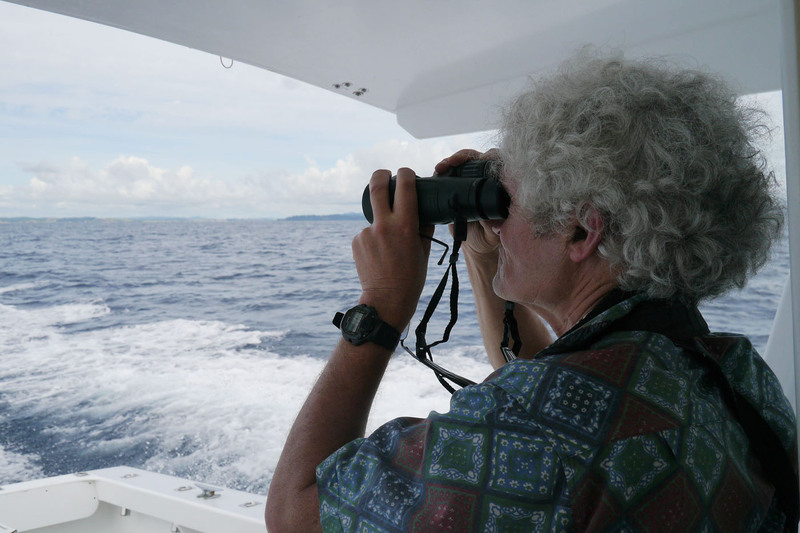 The plan for the day was to zigzag northwards towards Little Barrier, the Mokohinau islands and beyond, before returning to just offshore of one or both island groups for observations at dusk, when birds were expected to concentrate off potential breeding sites. The forecast was for mainly fine weather with a light to moderate NNE to NNW wind, although some heavy showers were announced for the afternoon. Off to a pleasant day at the office. Left to right: Dylan Owen, Jacinda Woolly, Chris Gaskin, Brett Rathe. Photo Jean-Claude Stahl, copyright Te Papa. Jean-Claude Stahl on the lookout. Photo and copyright Dylan Owen. We left Sandspit near Warkworth in the morning and headed to a known feeding ground of New Zealand storm-petrels north-west of Little Barrier Island. Following now standard procedure fine tuned over the years, the boat engine was mercifully stopped for chumming and drifting. This attracts petrels from downwind, as petrels have a good sense of smell which they use to both forage at sea and locate their nests ashore at night. 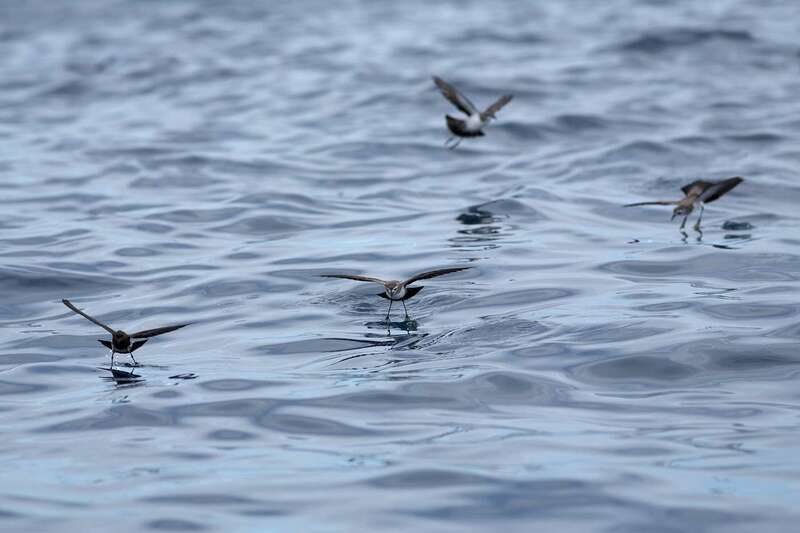 No New Zealand storm-petrels were seen there, but kingfish made the day for a growing flock of flesh-footed shearwaters, black petrels and white-faced storm-petrels, while Cook’s petrels and Buller’s shearwaters were passing by. 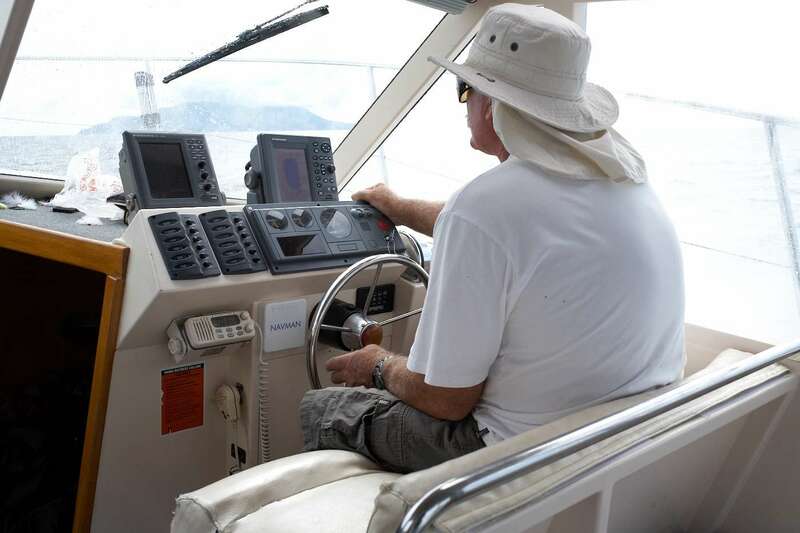 Waiting for the birds – the late kingfish would have probably agreed with the boat’s name. Photo Jean-Claude Stahl, copyright Te Papa. First off the blocks: flesh-footed shearwater (left) and black petrel ready for brunch. Photo Jean-Claude Stahl, copyright Te Papa. 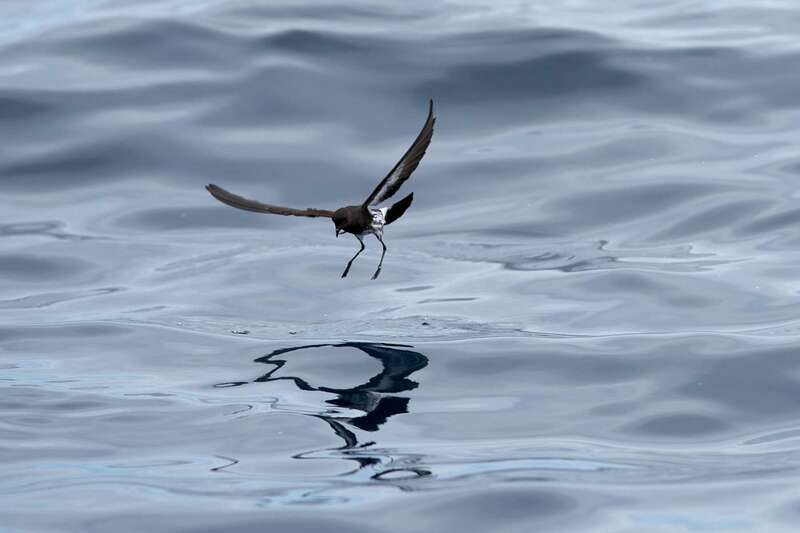 White-faced storm-petrel. Photo Jean-Claude Stahl, copyright Te Papa. 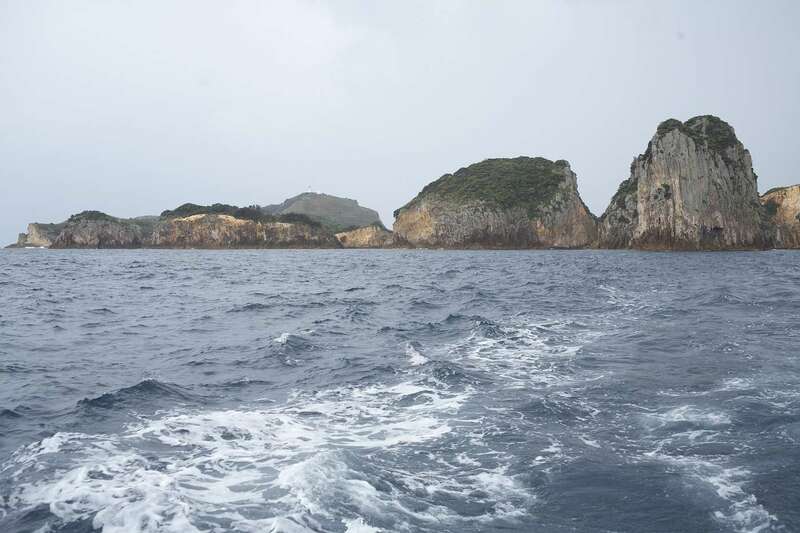 Next stop was Simpson’s Rock south of the Mokohinau islands. 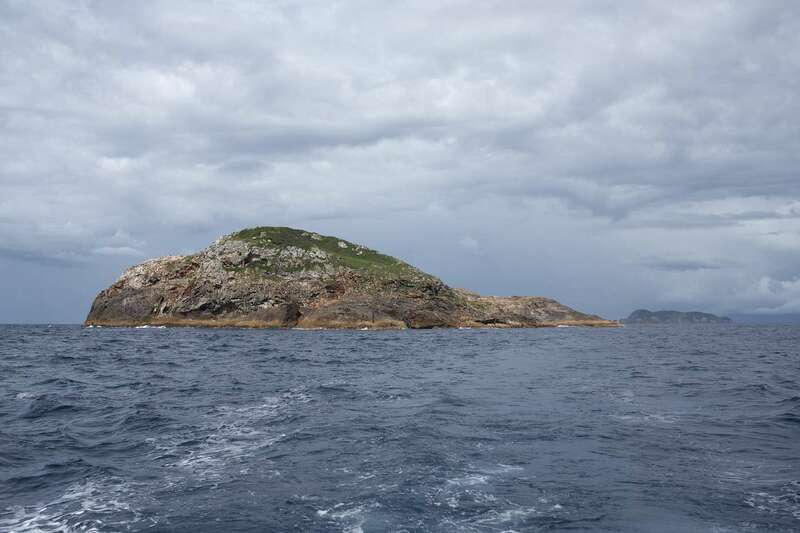 The station there was more successful, with up to four New Zealand stormies around the boat, as well as black petrels, flesh-footed and fluttering shearwaters, and a fairy prion. Fluttering shearwater in moult. Photo Jean-Claude Stahl, copyright Te Papa. 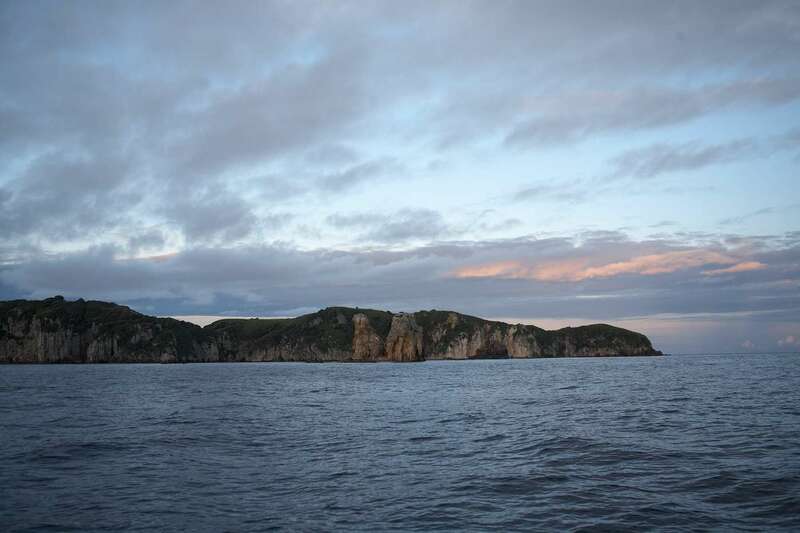 After Simpson’s Rock, we headed towards the Mokohinau islands to drop off Jacinda to Burgess Island and pick up Sarah Wells and Dylan Van Winkel. 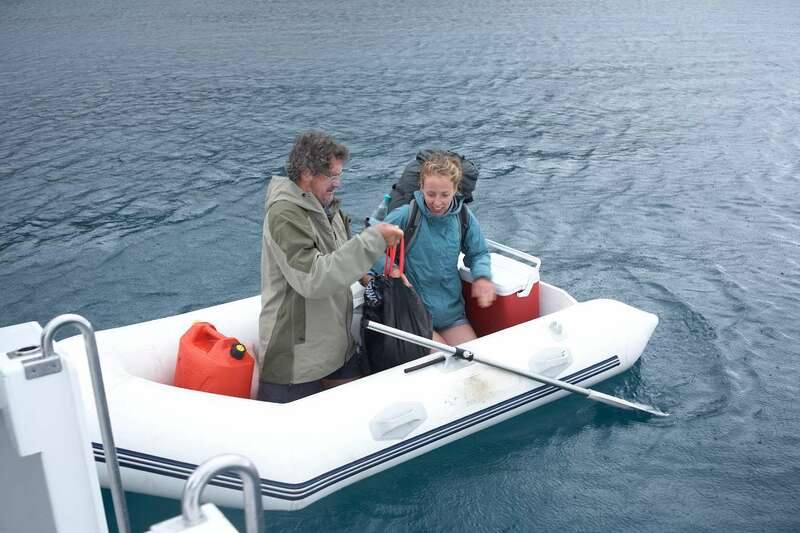 Both had completed their stint on the island as part of a study of white-faced storm-petrels. We took this opportunity to pass off Fanal island en route to Burgess, with red-billed gulls rather than petrels ruling the roost off the island around midday. Chris Gaskin preparing to row Jacinda Woolly off to Burgess Island. Photo Jean-Claude Stahl, copyright Te Papa. Sarah Wells and Dylan van Winkel back to “civilization”. Photo Jean-Claude Stahl, copyright Te Papa. Heading west from the Mokohinaus, with the Burgess Island lighthouse in the background. Photo Jean-Claude Stahl, copyright Te Papa. We passed Groper Rock when heading to a station west of the Mokohinaus, where the most notable visitor was a blue shark circling under the boat. From there we headed to a last offshore station north of the Mokohinaus. 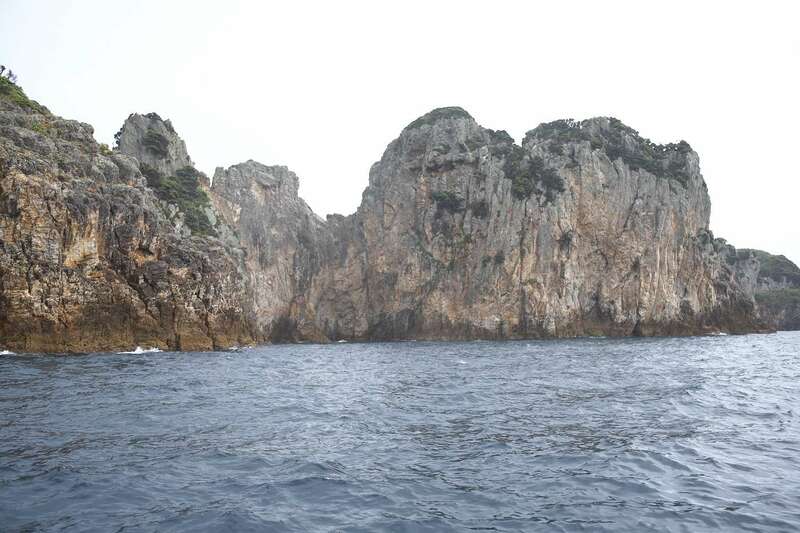 There up to four, possibly five New Zealand stormies came to the boat, along with one Black-winged and one White-naped petrel, the latter two hinting that we were nearing the shelf edge north of the Mokohinaus. Passing off Groper Rock when heading west from the Mokohinaus. Photo Jean-Claude Stahl, copyright Te Papa. 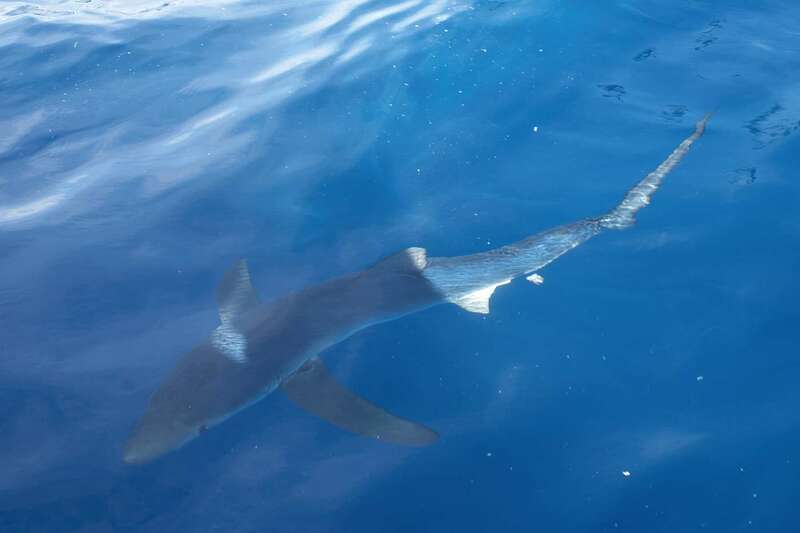 Sleek visitor: blue shark circling underneath the boat. Photo Jean-Claude Stahl, copyright Te Papa. New Zealand (lefthand bird) and white-faced storm petrels pattering their feet along the sea surface when feeding. 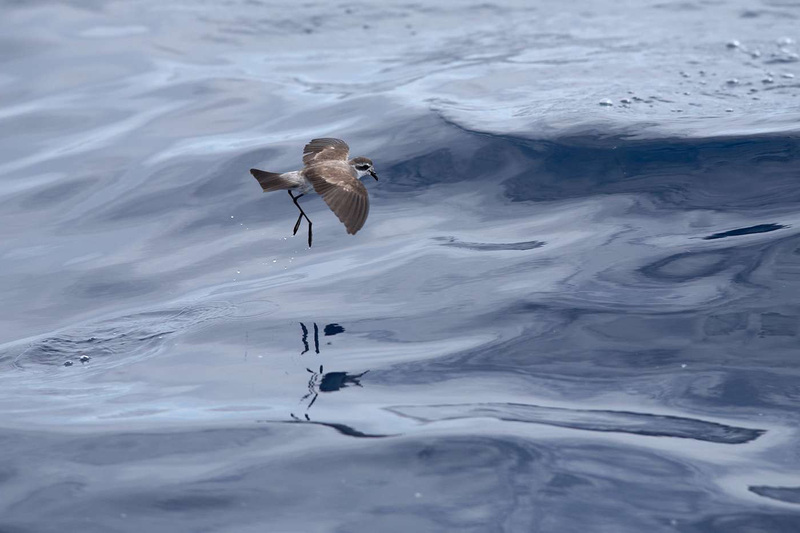 The word petrel derives from this habit of “walking on the water”, in reference to St Peter. Photo Jean-Claude Stahl, copyright Te Papa. These and many previous observations around the Mokohinaus had given some hope that the species breeds somewhere in this island group. However none were seen when we were back in the vicinity of the Mokohinaus at dusk, slowly cruising from north-east of Fanal island to the stacks south of Burgess Island then to Groper Rock. The total absence of birds there at the optimal time of day and breeding season does not bode well for the chances of a major breeding site being located in this island group. Although negative results can be crucial pieces of information in science (there are several reputed journals of negative results), they are ususally not the glamorous outcomes sought for by researchers. 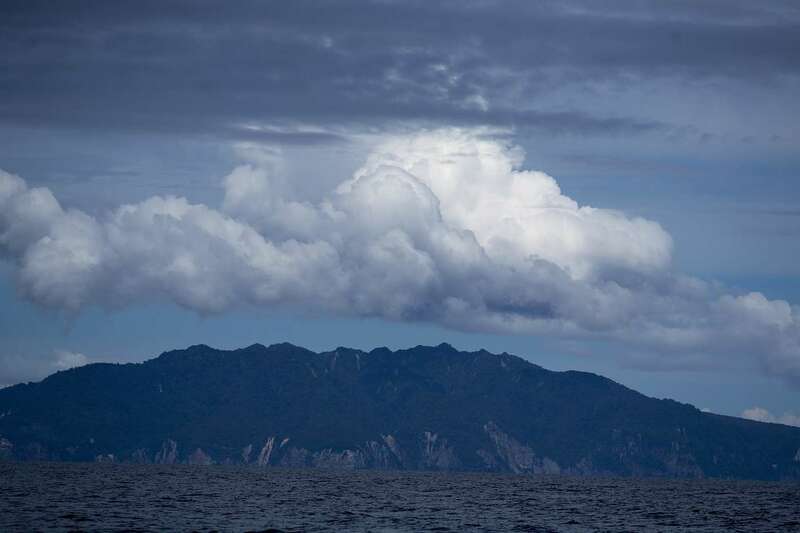 As a last throw of the dice, the team decided to head to another station off Little Barrier Island later in the evening. 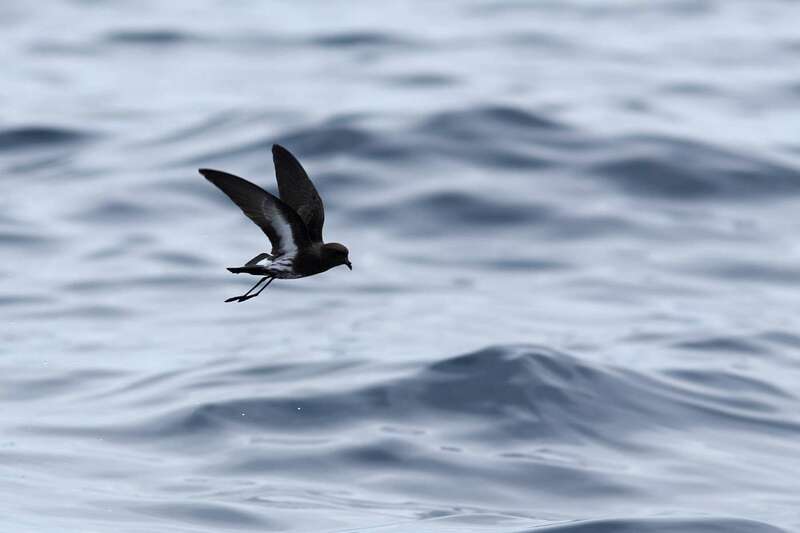 There the first New Zealand storm-petrel was circling around the boat in a matter of minutes, and up to six possibly seven were attracted overall, one of which was caught and banded by Sarah Wells and Chris Gaskin, adding to the NZSP research group’s tally for this season. This location was in the same general area where a bird had previously flown on board of a fishing boat anchored for the night off the island. 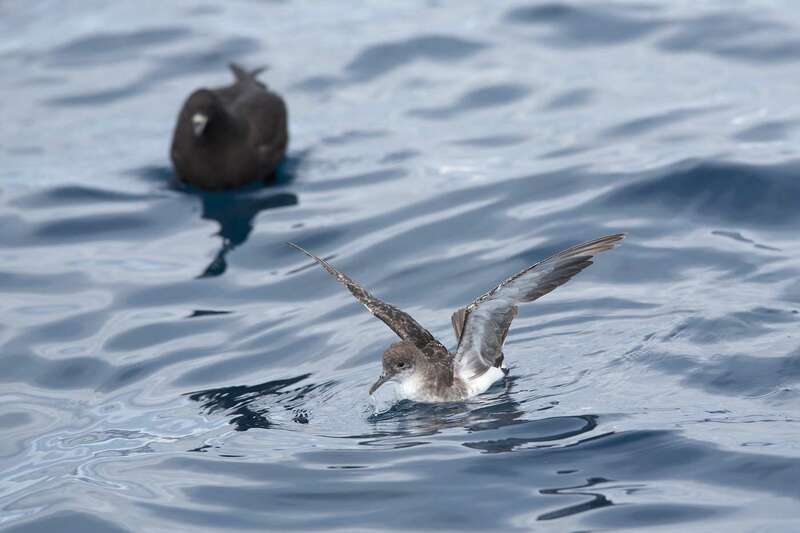 In Jean-Claude’s opinion, the activity there late in the day looked more what was to be expected off a petrel colony, and makes Little Barrier the best prospect so far for breeding sites of one of our most enigmatic birds. This however comes with a catch (as it always does): finding nests of a swallow-sized nocturnal bird in the formidable cliffs and ravines of Little Barrier will not be a picnic. 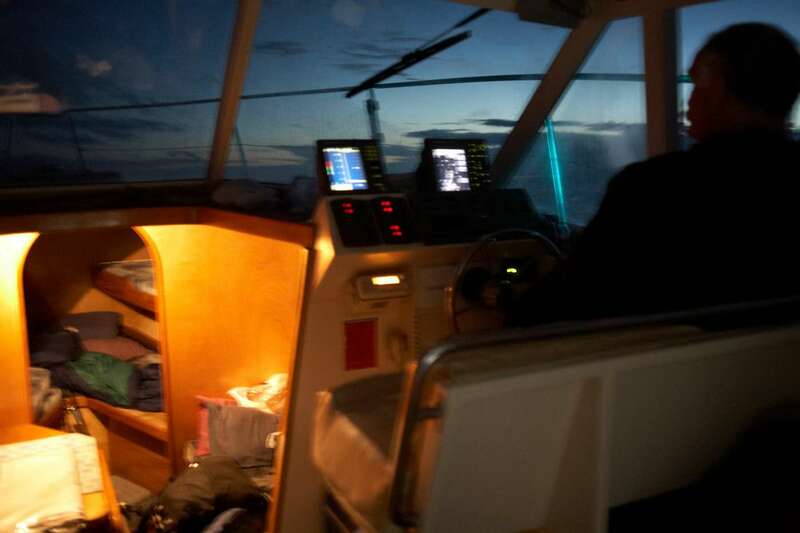 Seawatch off the Mokohinaus at dusk. Photo Jean-Claude Stahl, copyright Te Papa. Heading back via Little Barrier. Photo Jean-Claude Stahl, copyright Te Papa. 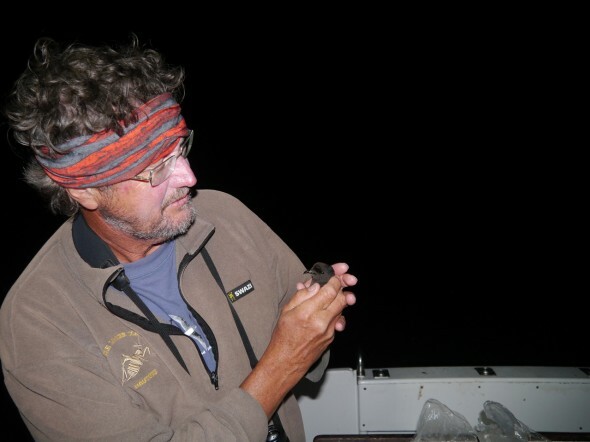 Chris Gaskin ready to release a New Zealand storm-petrel. Photo and copyright Dylan Owen. Best haystack to date – who will find the needle? Little Barrier seen from the north. Photo Jean-Claude Stahl, copyright Te Papa. 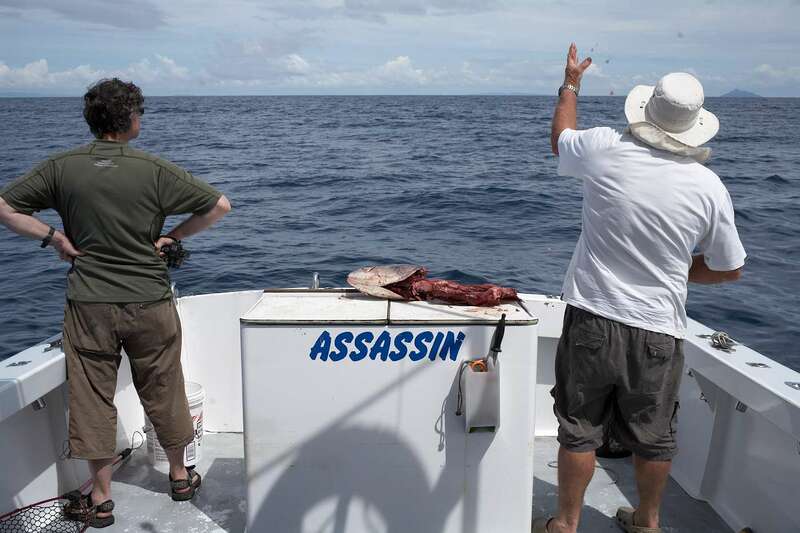 By Jean-Claude Stahl, Te Papa; Chris Gaskin, New Zealand storm-petrel project (BICCF-NZSP 2012); Brett Rathe, Assassin Fishing Charters. Quite an adventure. New Zealand is really a paradise and home to various animal species. That tricky blue sharks! !